Good oral hygiene is important for everyone, but it’s particularly important for people who have braces to take good care of their teeth. Wearing braces can increase the risk of oral diseases, including gum disease and decay, because braces tend to attract and trap food and plaque. Fixed braces are made from wires and brackets and unfortunately, although they are very effective in straightening the teeth, they can be a pain to keep clean. Brackets are hard to navigate with a toothbrush and they trap food, while the bands that apply pressure to the wires tend to attract bacteria; if bacteria and food deposits combine with saliva, this forms plaque a sticky film, which is a major cause of gum disease and cavities. As it is more difficult to clean the teeth when you have braces, it is common for orthodontic patients to experience symptoms of gum disease and decay; however, there are some solutions to help make teeth cleaning easier. Do I need to buy a special toothbrush to keep my brace clean? It is entirely up to you whether you want to buy a new toothbrush when you have braces; normal toothbrushes and electric toothbrushes will work just as well with braces, but there are specially designed products on the market, which may make cleaning your teeth a little easier, especially if you have fixed braces. Dentists recommend buying a toothbrush that has dipped bristles in the middle of the brush, as these can be angled easily and they provide a better shape for cleaning around the brackets. One example of an effective orthodontic brush is the Easy Braces Orthodontic Brush; this toothbrush is inexpensive and easy to use and it is specially designed to target the area underneath the arch-wires to prevent staining. Inter-dental brushes can be very effective for people with braces, as they are very small and easy to maneuver around the mouth; they are hand-held brushes, which are designed to remove food debris and plaque from the gaps between the teeth. You can buy a range of different sized inter-dental brushes. Flossing is important because it reaches areas of your mouth that you can’t clean with a brush; however, if you have fixed braces, flossing can be a little more difficult because of the wires. Flossing is really important for people with braces and it is worth investing in a floss threader to make flossing easier; this is a plastic needle-like device, which helps to make flossing easier. Examples of floss threaders include SuperFloss, which is available from chemists and direct from dental practices. 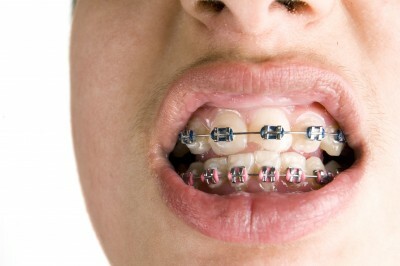 It’s essential to keep your braces as clean as possible to reduce your risk of gum disease and decay and discoloration. When you have your braces fitted, your orthodontist will explain how to brush and floss your teeth and they will also be able to recommend gadgets or products, which improve the efficacy of brushing when you have braces. If you have any questions or you are worried that you are not able to clean or floss your teeth properly because of your braces, do not hesitate to contact your dentist and ask for advice. Many orthodontic clinics and dental practices sell a range of products. For more information on brace treatments visit this official website.